Chicken, Bell Pepper, Onion, Mushroom, Sausages, Cheese, Olives & Tomato. Best Desi food. Good quantity and taste. Recommended. written by Majaz Elahi on Feb. 7, 2019, 11:49 p.m.
written by agha umer on May 1, 2018, 3:50 p.m.
Want a delicious and fulfilling burger but not the usual one from one of those international fast food chains? Then look no further, because Rizwan Burger is the perfect place for you. 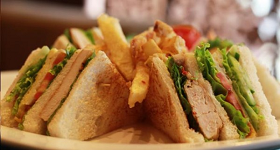 It is famous for its appetizing burgers and toothsome sandwiches. Everything on the menu has a distinct flavour that you won’t find anywhere else and that is guaranteed. Rizwan Burger has a massive fan following because of this. People from all over Lahore visit Rizwan Burger for the taste it has to offer. For all the times when you didn’t feel like eating home cooked food, but wanted something that is truly delicious but also easy on the wallet, now you have the place that will definitely become your go-to in those desperate times. Whether you are craving a heavenly mid-night snack or want something to wipe off the hunger at lunch, Rizwan Burger’s menu has everything for you. There are so many options to choose from. Whatever your preference, you will be covered. There is the Mutton Burger, Chicken Grill Burger, Jalapeno Burger, Jalapeno Beef Burger, Zinger Burger, Rizwan Special Chicken Burger, Chicken Breast Burger, Crunch Burger, Chicken Cheese Burger, Special Shami Burger and many more. Bring along your friends, and everyone will have something to enjoy. Have you tried their sandwiches? If not, then hurry up! Their sandwiches are one of the best you’ll get in town. They are way better than the high end ones. These sandwiches are so fulfilling that you can easily share it with a friend too. There is the Grill Sandwich, Tikka Sandwich, Chicken Breast Sandwich, Chicken and Chicken Cheese, Beef, Special Shami Sandwich, and the plain Shami Sandwich. What are the other items on the menu you ask? Well, you can get whatever your heart desires, because all your foodie dreams will come true right here at Rizwan Burger. You can treat yourself with a number of different pizza flavours like Hot and Spicy, Chicken Fajita, Chicken Supreme, and others. Other than fast food, there Chinese Cuisine and Desi Cuisine is on the menu too. Apart from food, several drinks are available too. Their fresh juices are truly a treat. The flavours available are Anar, Grapefruit, Orange, Mango, Strawberry, Falsa, or whatever is in the season. Hungry? Then order now Online! Yes, now you can order your favourite food from Rizwan Burger right at your doorstop. Wherever you may be in Lahore, your food will reach you at the speed of light and all this is made possible by Cheetay. All you have to do is download the Cheetay app or visit the website and leave the rest on us. Happy Eating!